September 2017 saw TMW Unlimited launch Kinder Bueno’s Adulting campaign, using social language to tap in to a grown up audience. Designed to resonate with Bueno’s majority audience who would “prefer to permanently remain 29 if they could”, vloggers and influencers are shown rewarding themselves for ‘adulting success’. So the concept was based on research, the idea seemed sound, it made sense, and was easy to understand. I didn’t like it. Definitely 100% didn’t like it. To me the characters felt weird and patronising. I didn’t like it so much that I decided to use it as an example of annoying ads in a monthly team meeting. I pressed play, turned to the team to absorb all the negative comments, and… disaster. Rich, one of our creative directors, said he really liked it. Oh. Balls. He’s much more creative than me, and more experienced. And taller. I knew my opinion was wrong, and sat very sheepishly for the next ten minutes until the pain and embarrassment subsided. I realised afterwards that this was nonsense (apart from the height thing). It’s an ad for chocolate for goodness sake. But being a bear of many opinions, disagreeing felt devastating. But also quite good. Impactful advertising generates emotional connection, but that doesn’t always mean the emotion is good. Research averages suggest 4% of advertising is remembered positively, 7% negatively, with 89% disappearing into an ad black hole. So Rich and I were in different groups here. Excellent. There’s some logic. I can rest easy and move on. The tightrope to fall on the right side of though is whether that ad is perceived to be SO annoying it actually harms the brand, or whether it does its job and reinforces the brand despite the annoyance. In 2009, GoCompare introduced Gio Campario, their controversial opera singing mascot that left the ‘Go Compaaaaaaare’ earworm firmly embedded in viewers minds. Refreshingly, in 2012 this character’s irritating qualities were acknowledged in a range of ads that showed high profile celebrities ‘Saving The Nation’ by killing him off before he could start warbling. Who knew gentle Sue Barker was partial to a rocket launcher? Gio Campario made the ads annoying. Being annoying made them memorable. And this was cleverly manipulated to make them a winner. And after a two-year hiatus, the exasperating man was back – looks like the brand, and the people just couldn’t live without him. #GioReturns cemented GoCompare in first position of the UK’s most annoying ads in 2015, above serial penny cleaner Barry Scott, and the rather more disturbing Wonga puppets. There’s a common theme there though – I clearly remember all three characters, their brands, and would recognise them against their competitors. Annoying characters are annoying. But that’s the beauty of them I suppose. They’ll likely feature in a campaign based on solid research, audience insight, and the need to find a voice in a crowded space. So whilst I still can’t completely make my peace with Bueno’s grownups, I know it’s ok for other people not to feel the same. For now. And OBB has taught me that ‘being fierce’ stems from having conviction and fighting for what we believe. It’s not about never backing down, it’s about having an opinion and not being afraid to voice it even if it is different to others. 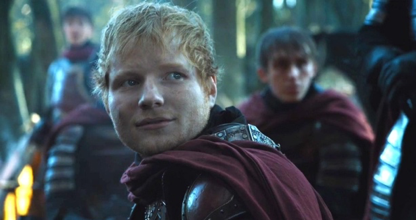 Oh, and Ed Sheeran’s just there because his character was REALLY annoying in Game Of Thrones. I won’t retract that. Not even if Sue Barker goes after him.